OCTOBER 21--The Massachusetts man arrested today on federal terrorism charges once traveled to New York City and posed for photos at ground zero showing him grinning widely and pointing one finger up in the air. Tarek Mehanna, 27, was named today in a criminal complaint charging him with conspiring to attack shoppers at a U.S. mall, as well as kill an American politician. According to investigators, Mehanna, pictured at left, traveled to Iraq, Pakistan, Yemen, and Syria to seek training from assorted terror groups. 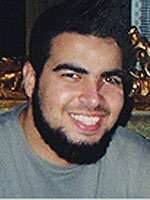 According to an affidavit sworn by FBI Agent Heidi Williams, a search of Mehanna's computer turned up photos of him and others enjoying their trip to the lower Manhattan site where thousands died during the September 11 attacks. In a June 2006 "communication" cited by Williams, Mehanna suggested seeking Allah's mercy on the World Trade Center buildings, "not the sinners that were in it."